These twelve-inch action figures really talk. Press figure's stomach to hear electronic phrases. Advanced three-mode talking system lets you control what they say. 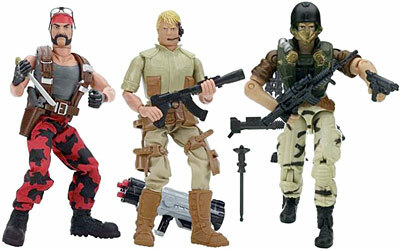 You can mix and match each of these modes to change the way GI Joe rallies the troops and charges. He speaks complete phrases, says one word at a time and shouts. Action figure comes with an array of accessories so that he's fully prepared, as well as shirt, pants, armored vest, boots, gauntlets, knee pads, helmet and communicator, backpack, canteen, grappling hook launcher with cord, figure with accessories, and file card. Hi-Tech plays a valuable role by taking control of GI Joe's complex technological systems with voice effects talking technology.